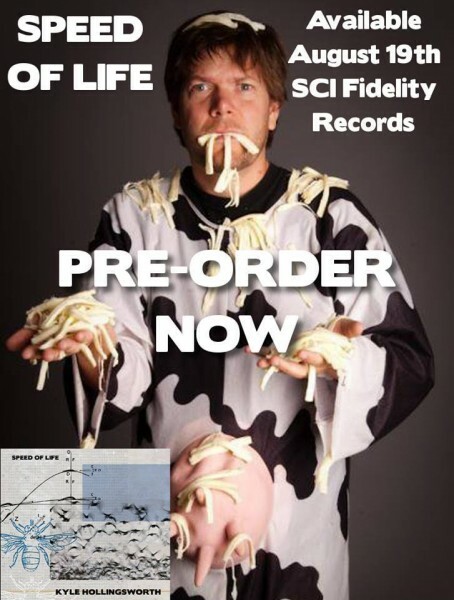 SCI Fidelity Records: Archive : “SPEED OF LIFE” Pre-Order Contest! ☻ The first 100 people who pre-order the album will receive a free SPEED OF LIFE koozie. ☻ 20 lucky winners will receive a signed piano key from one of Kyle’s old organs. ☻ One (1) grand prize winner will receive a signed piano key, 2 free tickets to any SCI show in 2014, Kyle’s cow suit, and the once-in-a-lifetime opportunity to collaborate on a new craft beer with Kyle himself. Help determine the style, flavors, and recipe for a brand new microbrew – created by Kyle & You! ☻ Kyle Hollingsworth will sign every single SPEED OF LIFE album that is pre-ordered before 8/19/14. He may even write a special poem… or draw a picture of a cat. * Please note: CD’s will not be shipped until just prior to the official release date of August 19th. Pre-order contest entry valid for orders placed through August 18th, 2014. SPEED OF LIFE marks Kyle’s third solo album, and was inspired by all facets of his life–from beer to babies to music to mayhem–and ranges stylistically from ‘60s funk to modern electronica, featuring both instrumental and lyrical tracks. It was recorded during the well-known Boulder, CO, flood of 2013, where Kyle was holed up in his home studio, fearing water would pour onto his gear. SPEED OF LIFE brings together feature performances from many great artists and friends Hollingsworth has surrounded himself with over recent years including Dave Watts (drums – The Motet), Garrett Sayers (bass – The Motet), Dan Schwindt (guitar), Jason Hann (percussion – The String Cheese Incident), Michael Kang (guitar – The String Cheese Incident), Dominic Lalli (saxophone – Big Gigantic), Bonnie Paine (vocals – Elephant Revival), Gabriel Mervine (trumpet – The Motet), Matt Pitts (saxophone – The Motet), Kim Dawson (vocals – The Motet), and LaDamion Massey (vocals).